Six men locked away in steel tubes for a year-and-a-half to simulate a mission to Mars have emerged from isolation. The Mars500 project, undertaken at a Moscow institute, was intended to find out how the human mind and body would cope on a long-duration spaceflight. It is a venture that has fascinated all who have followed it around the globe. The study even saw three of the men carry out a pretend landing on Mars, donning real spacesuits and walking across an enclosed sandy yard. 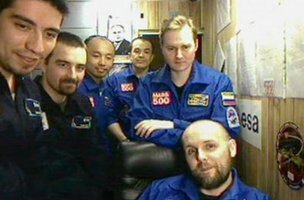 "The international crew has completed the 520 day mission," Russian commander Alexey Sitev announced after stepping through the opened hatch of the Mars500 "spaceship". "The programme has been fully carried out. All the crew members are in good health. We are now ready for further tests," he told those gathered to witness the emergence.